Kenyan Grasses for Livestock Diet Key to Solving Global Warming? Rains Fail Again in East Africa, Hunger On the Rise - U.N.
By adopting agroforestry and improved agricultural practices, a community in western Kenya has increased their income and improved their living standards. They are now training other farmers to do the same. Smallholder farms make up most of the remote village of Siwot in Kericho County. Part of the wider western Kenyan region, most farmers grow maize, beans and vegetables for subsistence, and coffee and sugarcane as cash crops. And like many communities in western Kenya, and in the Nyando river basin in particular, they are aware of the potential that impact climate change will have on their lives and those of their children. For years, the farmers’ efforts in small-scale agriculture produced little meaningful return. But this did not stop the community from having a collective vision for their prosperity: They wanted to improve their living standards, educate their children, engage in farming as a business and add value to cash crops to increase their income. What they lacked was the knowledge to make this happen. So, in 2008 some 46 men and women from the village got together to form the Toben Gaa Self Help Group with the express aim to achieve prosperity for themselves and their community. Since 2009, the World Agroforestry Centre (ICRAF) has been implementing a project designed to enable communities in the Nyando watershed to mitigate the impact of climate change-related challenges, by improving their adaptive capacities. These projects are instrumental in maintaining and even improving their livelihoods and general well-being. 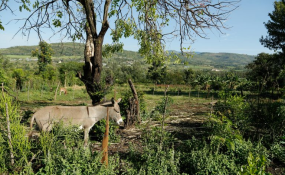 According to scientists at the World Agroforestry Centre, on-farm forestry, or the intentional use of trees in the cropping system, has proven to be effective in the mitigation of and adaptation to climate risks. Taking into consideration the sometimes complicated processes of rural transformation, a new approach to agroforestry promotion, Asset-Based Community-driven Development, was adopted in in 2011. Asset-Based Community-driven Development, or ABCD, teaches participants to understand and appreciate the value their belongings, and to use their various natural, physical, human, social, cultural and financial assets to improve their livelihoods. The ABCD approach was implemented in collaboration with the Coady International Institute, a pioneer in teaching community development. The project was supported by the Comart Foundation. As part of the ABCD approach, ICRAF supported community groups, including the Toben Gaa Self Help Group, with technical training in specific agroforestry and agricultural practices. The groups identified activities that could potentially improve their livelihoods through their community action planning exercise. ICRAF and the Coady Institute developed three tools for use in the project. They include a community-led value chain analysis, the household and commodity Leaky Bucket and the Commodity Ledger. The value chain analysis tool describes all the activities and people involved in agricultural production from the farm through to the consumer. The Leaky Bucket helps Group members to understand inflows and outflows of resources – mainly money – and the circulation of resources within the local economy or household. The Commodity Ledger tracks expenses throughout the farming cycle, from planting to weeding to harvesting, while also accounting for income from sales. It allows the farmers to both plan for purchases and the time to sell their products. Making better informed decisions both empowers and ensures ownership on the part of the farmers. Over the years, members of the Toben Gaa Self Help Group acquired skills and knowledge in leadership, local resource mobilization and self-assessment, skills that have helped them manage their community group efficiently. They gained important skills in agroforestry, coffee and horticulture farming, dairy farming, poultry rearing and farm management. Some members trained as trainers in agroforestry and best agricultural practices and are now training farmers from different villages. The Group has successfully engaged in climate-smart agricultural practices in a self-driven and innovative manner. Their work has greened the immediate neighbourhood, and achieved 10% tree coverage in their area. They have also changed land use to feature more inclusive and sustainable farming systems and methods. These advances have, in turn, improved nutrition and livelihoods among community members by providing alternative sources of food and income, particularly by cultivating fruits and other multipurpose trees. Individual members have established tree nurseries. Every home now has sufficient firewood for domestic use. Members also increased their agricultural production and sales and improved their access to financial resources through group savings and loaning associations. The wider community, inspired by the Group’s success, now looks to them to teach about improved farming practices so as to raise their living standards. The impact for the Group’s member has been as varied as their needs. Rusi Cheruiyot now has a tree nursery on her farm, where she and her husband grow coffee, papaya, mango, passion fruit and Grevillea seedlings for sale. Together they’ve planted 400 trees. Members of Toben Gaa Self Help Group served as farmer-trainers during the final phase of the project, ‘Accelerating Adoption of Agroforestry in Western Kenya (Triple A)’. Their recently acquired skills not only helped other smallholder farmer groups improve their own practices, farmers not part of any formal group also visited their farms to learn. “I realized that a woman can work and teach others”, says Esther Ruto, who decided to join the group to educate her eight children. “I used to herd cattle. In the training I received, I learned to care for my cattle. I am now a farmer trainer. I sell firewood from the prunings of the trees on my farm. Leadership has helped me see new places and achieve a lot.” She is proud that women trainees are particularly happy with her training and like to visit her farm. The final phase, implemented from January 2015 to mid-2017, used the ABCD approach, combining three different methodologies to community development. These are: general group capacity development trainings to strengthen institutional capacity of community groups; technical and practical skills in self-selected and context-specific agroforestry and agricultural best practices; and sustainable scaling of trainings through farmer-to-farmer extension. The different approaches were implemented with varying delivery mechanisms, and follow unique processes, in line with specifically formulated objectives and conscious of potential barriers. Triple A reached nearly 3000 smallholder farmers in four locations of the Nyando basin in western Kenya. Copyright © 2017 World Agroforestry Centre. All rights reserved. Distributed by AllAfrica Global Media (allAfrica.com). To contact the copyright holder directly for corrections — or for permission to republish or make other authorized use of this material, click here.